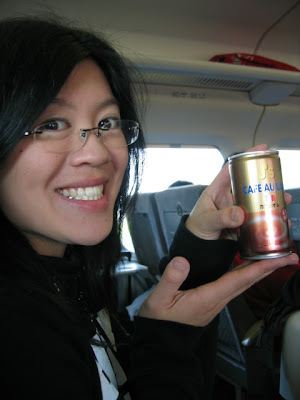 Me with canned Café au lait. The solution? Funky Japanese Vending machines! Every other street corner in Japan has vending machines, selling a massive variety of hot and cold drinks, including soup and alcohol. And they're cheap! ¥110 for a tasty canned coffee totally beats ¥500 or whatever it is for a latte of variable quality at Starbucks or any other cafe. Here's a tip - on a cold winter morning, popping a couple of warm coffee cans into your pockets will totally keep you warm as you walk to the station. Sarah with coffee of choice - Boss brand Rainbow Mountain Blend. It's advertised by Academy Award® winner Tommy Lee Jones, so you know it's gotta be good. Click here for the awesome TV commercial. 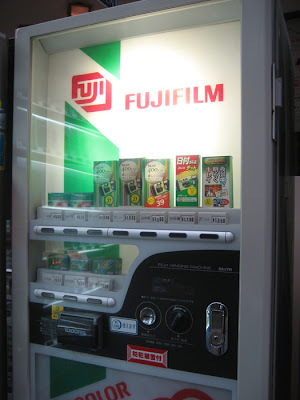 Vending machine selling film and disposable cameras. 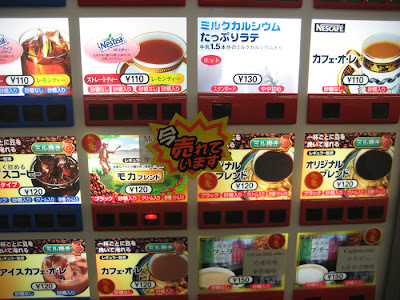 The following photo is of an awesome coffee/tea vending machine in Nikko train station. This one sells cups, not cans. The red ones are for hot drinks, and the blue ones on the left are cold. And here it is in action. Ta-dah! Good coffee is pretty much universally expensive and on the quality side of things it is a matter of being in the know. Let's face it, as you are Melbourne resident I would be gutted if you could not find a good latte on your own turf. Just as I would be able to get a decent espresso in London. Unfortunately when you are tourist that search starts all over again coupled with local differences. I have had some wicked coffee in Vietnam... albeit a bit different. Anthony Bourdain sums it up well in "a cook's tour". Love the work.. the blog is excellent. I still check out your blog all the time. Love your trip highlights. Also fantastic in Japan....my husband was in the Airport Lounge in Japan for Business Class and they had the most amazing beer machine. It was an automatic beer pourer. All you did was put the beer glass underneath and hit start and an arm would grab the glass, tilt it while the beer started coming out and then straighten the glass at the end to get just the right amount of foam on top. Amazing! 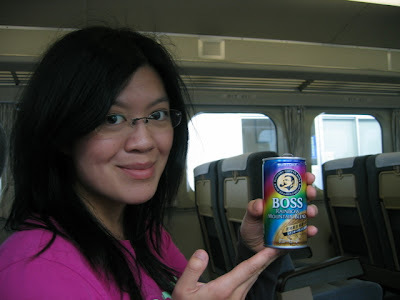 Ooooh i'm having serious Japanese canned coffee nostalgia! !